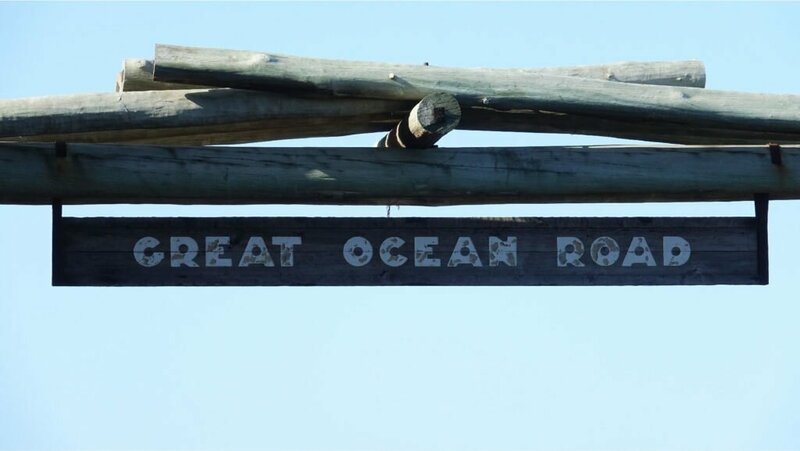 The Great Ocean Road is for sure one of the most visited spots in the country. 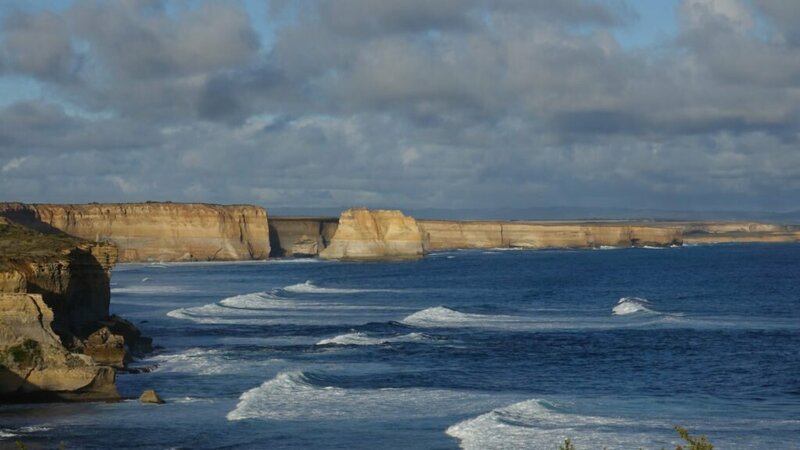 Both in winter and in summer, the coast of Victoria receives hundreds of tourists, mostly Asians. They rent a car or pay for a one-day trip bus (you can make it by bus leaving from Melbourne to the 12 Apostles and returning the same day). 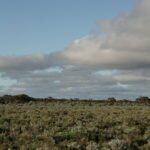 It is a short stretch of just 243 kilometers and borders the south-east coast of Australia. It goes from Torquay to Allansford. Lush forests, beaches, and viewpoints overlooking millenary rocks that emerge from the sea. 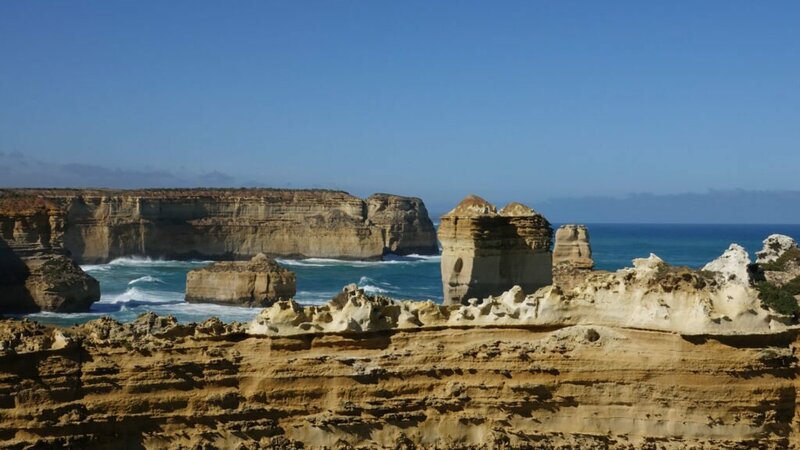 Home of the famous “12 Apostles” and other magnificent stone formations such as “Loch Ard Gorge”, “The Grotto” and “London Bridge”, this road crosses several coastal towns and all of them are prepared to receive visits from all over the world. It can be done by car, bus, walking, cycling or whatever you want. 1- Beware the cars! We got tired of listening to this recommendation, but on this road, we had to have more than attention. As mentioned, there is a lot of tourism that comes from China where the cars go in the opposite direction than Australia. There are signs written in Mandarin but there are several people who forget to drive in the correct lane. There is a high number of accidents and you have to be aware, visible and then enjoy. 2- There are steep climbs. 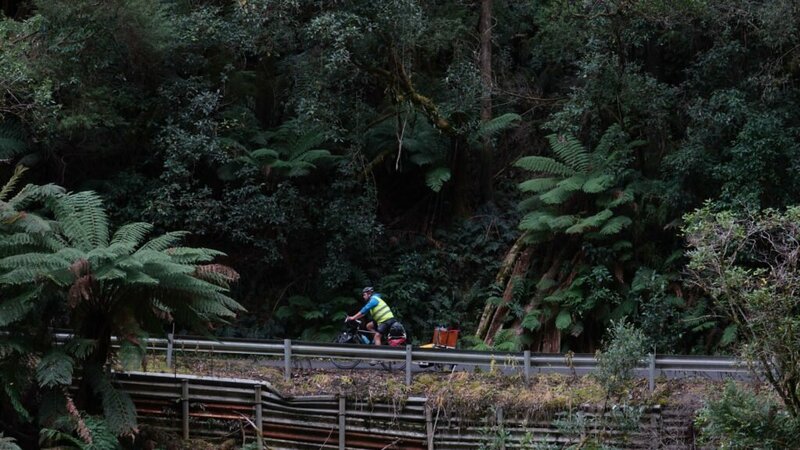 We recommend doing it with the least possible weight on the bicycle. 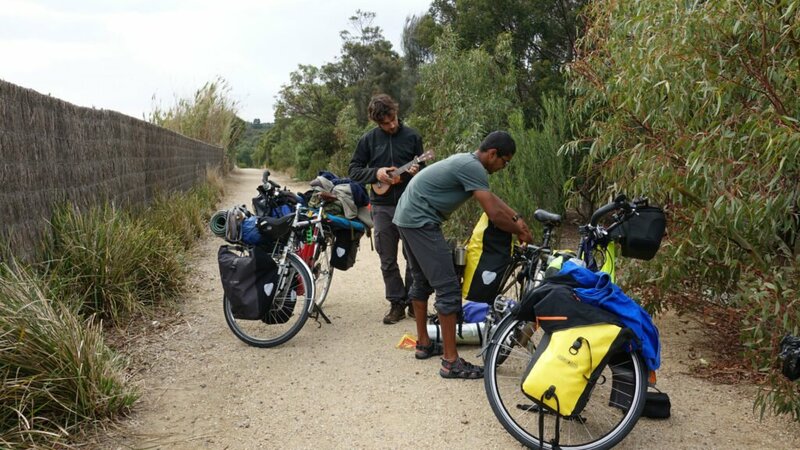 We carry instruments in two trailers so our weight is exaggeratedly heavy and some hills were really hard. So in more than in some sections, we had to go down the bike and carry them walking. Anyway, it can be done and it is not an extreme effort at all. There is water, people and food, so if you go with a lot of weight have a little bit of patience and pedal! 3- Enjoy the way. 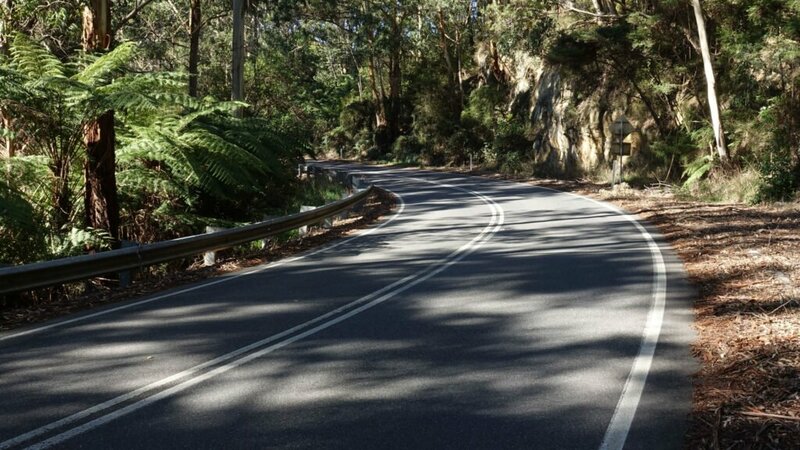 It is truly one of the most beautiful and attractive bike roads in the world. Being there was a very pleasant sensation. Take notice of the place where you are and understand that it is a unique opportunity. 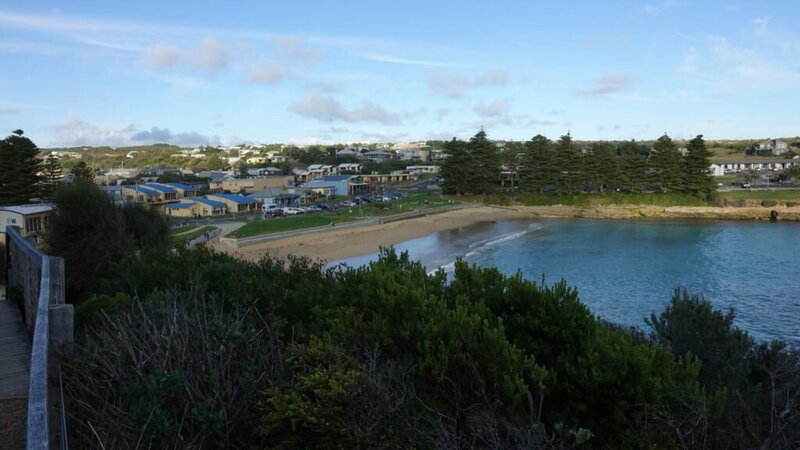 Warrnambool is a big city for what we were used to. We just spend the night to start with fresh energies. On the outskirts of the city, we began to feel the landscape to come. 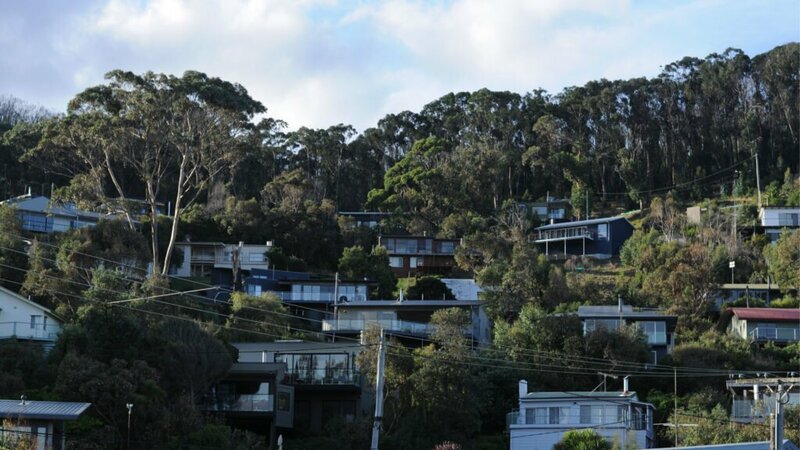 Small houses up in the hills, a lot of climbing and beach vegetation. 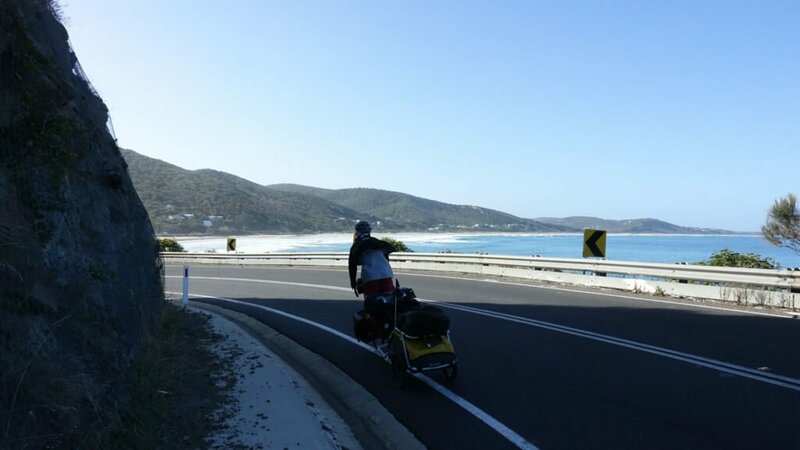 The first day we did a short bike ride of 53 km on the “Princes Highway”. It was cold and raining since we did it in the month of May. The beautiful thing about this day was that we were able to grab a bicycle trail along the coast that took us 5 km, little but ideal not to be constantly next to the cars. We arrived at a tiny town called Peterborough where we had to spend the night in the bathroom. It was very cold to sleep outside and being inside with shelter was the best solution. Eating early and having a good sleep. Here we began to acknowledge what great stones that appear in the middle of the ocean are like. While you are on the road, you see entrances to the different spots to see the rocks. This day we met “Bay of Islands”, “The Grotto”, “London Bridge” and “The Arch”. We decided to stop at all the entrances. We knew it was once in a lifetime opportunity and took advantage of each place we cycled through. Something we always try to do. These stones are incredible and in “Bay of Islands” we had a beautiful experience. We arrived very early, we were alone and we had breakfast there. We drank some “mate” and enjoyed that silent morning. The sound of the water was amazing and we stayed quiet for a long time. Afterward, we met several people who came to talk to us when they saw our bicycles. Finally, we arrived at Port Cambell after 16 km. 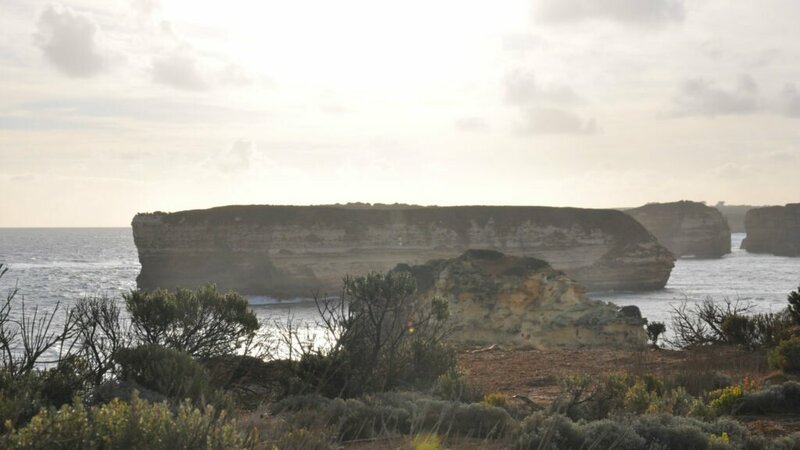 When we arrived in Port Cambell we spoke with Will and Fabiola, the couple that runs the Port Campbell hotel. She is from Peru and he is Australian. They invited us to eat and we played with Guampas del Sur at the bar. A luxury! While we were playing at the hotel we met Railey. She is Australian and lived 6 months in Argentina. We talked for a good time and had a great night. Having no place to sleep, she invited us to spend the night at her grandparents’ house. It is the only house with an ocean view in the town of Port Cambell. A perfect and beautiful location. Railey told us that she had to go to Melbourne but we could stay there without any problem. We woke up we went to the place where her mother works to thank her for the invitation and saying goodbye to this beautiful town. Railey’s mother invited us to stay two more days in the house and we enjoyed it to the fullest. 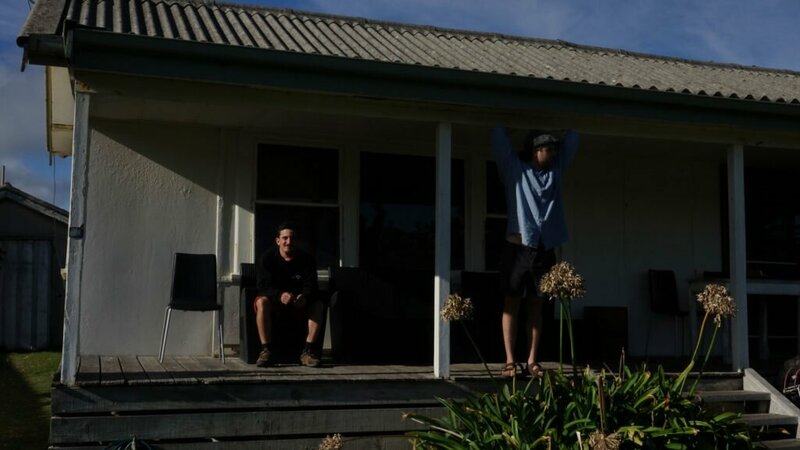 We got to know Port Cambell in depth and also, in a house overlooking the sea. 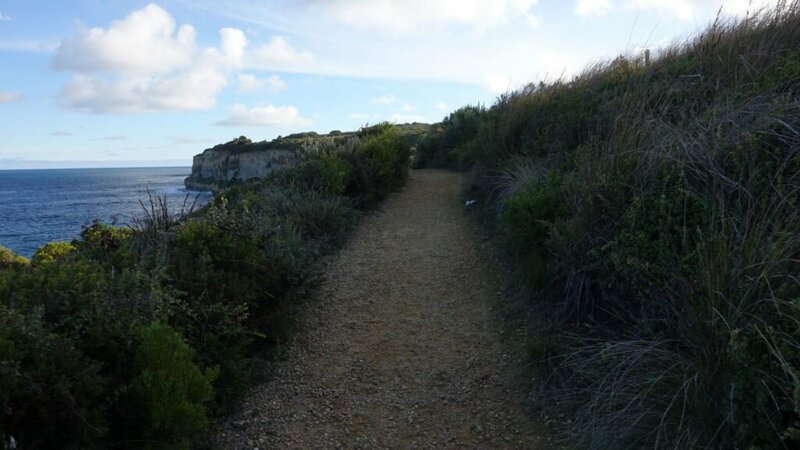 We did one of the walks that takes you bordering the sea and the views are amazing. We couldn´t have had a better time. Despite being comfortable in the dream house, we started a new cycling day again. Sometimes the beginning is hard, but once the legs start to warm up, there is no turning back. 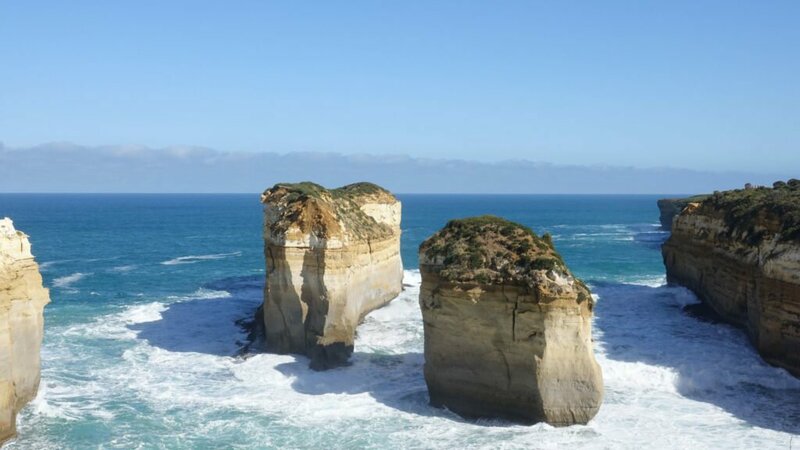 This day we were going to see the “12 apostles”, the great attraction of the Great Ocean Road. 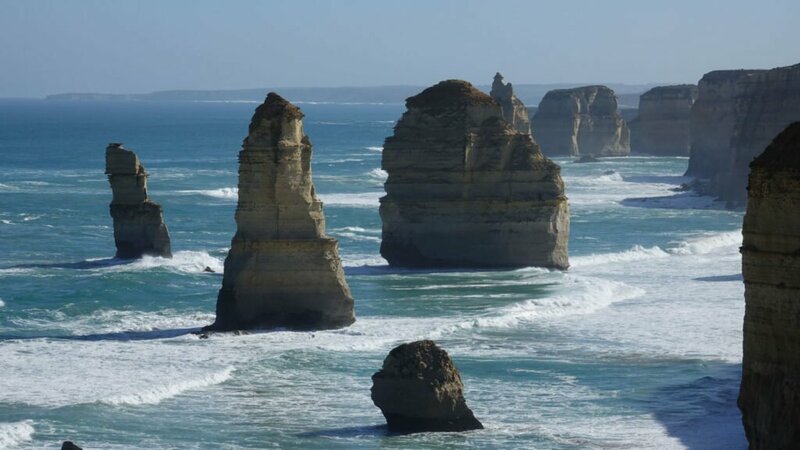 Honestly, the other stones have nothing to envy to the 12 apostles and can even be enjoyed more because there is not so much conglomeration of people. Before arriving you find the stones of “Loch Ard”, one of the most beautiful for us. As usual, we drank some “mate” while we talked with different people who came and got interested in our story. We took out the guitar, the box and sang. 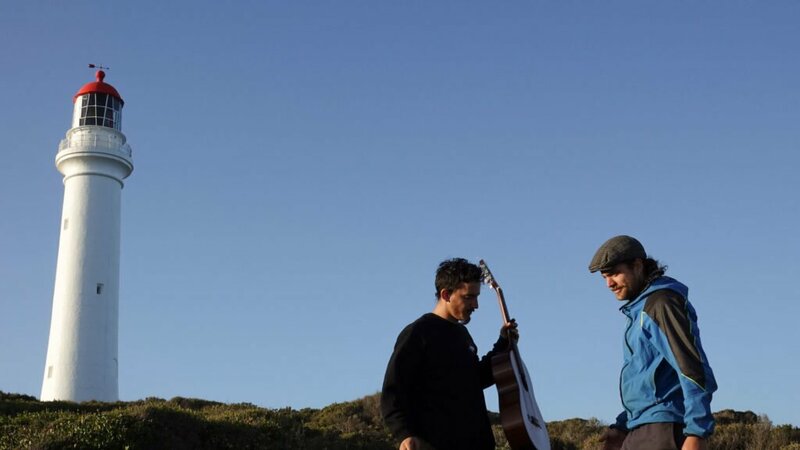 We made a video of the song “Y vos de mí” from Guampas del Sur and many tourists came curiously to see what we were doing. 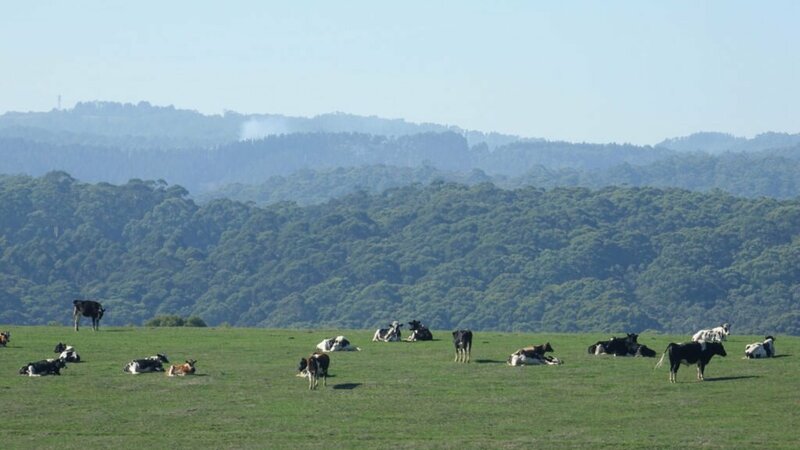 We decided to continue on our way to the “Otway National Park”. A bit of gravel road and we enter the forest. 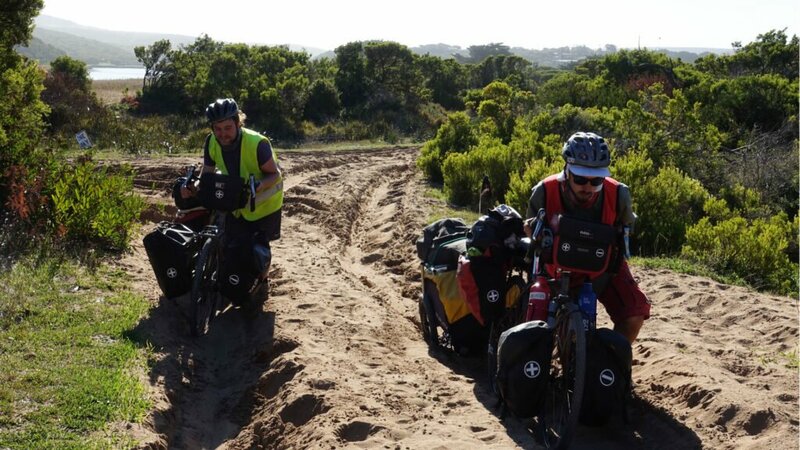 We saw a sand road and had the brilliant idea of pushing the bicycles 200 meters, believing that the road would then let us pedal. In total, we made 400 meters, 200 to go and 200 to return because it was impossible to walk around for 30 km. When returning and stopping a while in the national park, the night began to fall. We got on the bicycles and went in search of a farmer who let us camp in his garden. 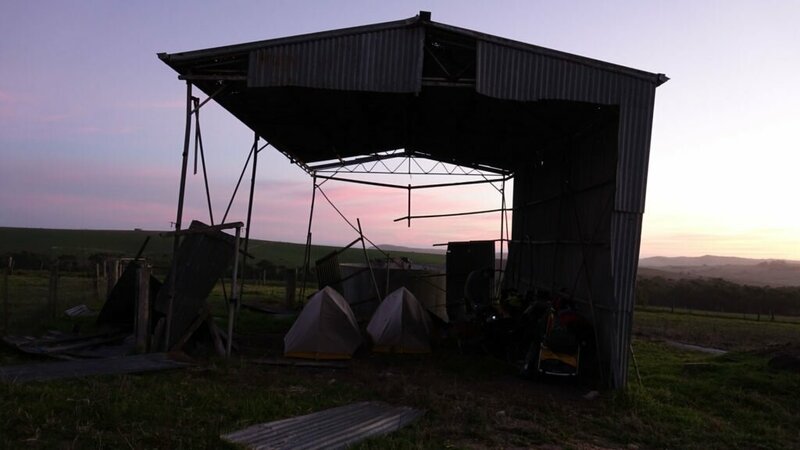 So it was then when we met a man of few words but generous enough to allow us camp in his old dairy farm. The terrain was irregular but we could sleep and eat very well. 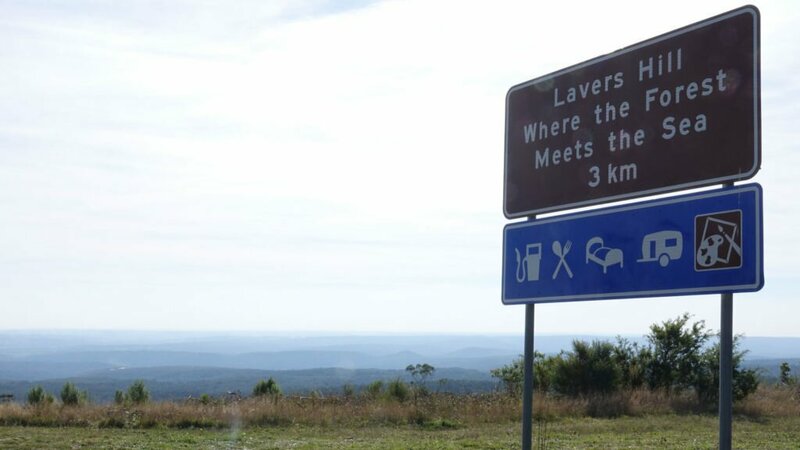 This is the description of the sign on the road that describes Lavers Hill. This small place is, generally, a place where people just stop for a coffee, eat something and continue. There is a motel to sleep in and a store, nothing more. It was a day of intense cycling going uphill. Up, up and up. Again, due to our weight, it became difficult but cycling inside the forest made it unique and unrepeatable. In Lavers Hill, we arrived at the store and they gave us food that was not going to be sold as they were about to close. We talked to the owner and she invited us to set up the tents in a garden that was next to the store. It is a specially designed garden and it was full of flowers and colors. We set up the tents, ate a lentil stew and went to the hotel. We ordered a beer and then went to sleep. It was a very wise decision to go through “Beech Forest”. 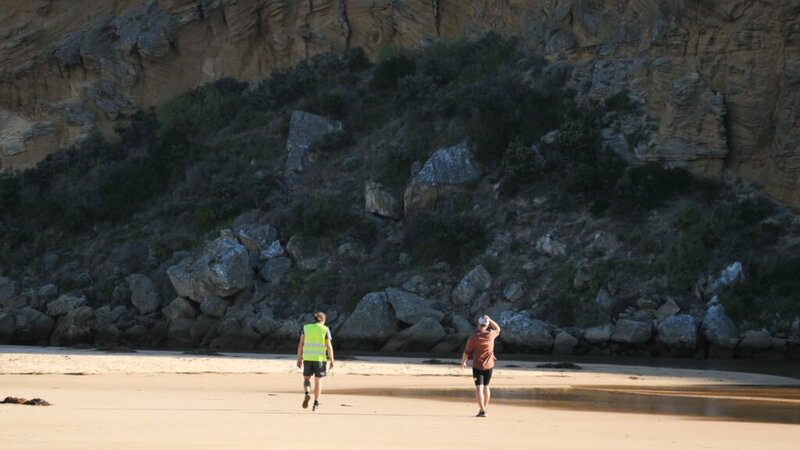 The question was the following: go to Apollo Bay by taking the sea or entering the forest. 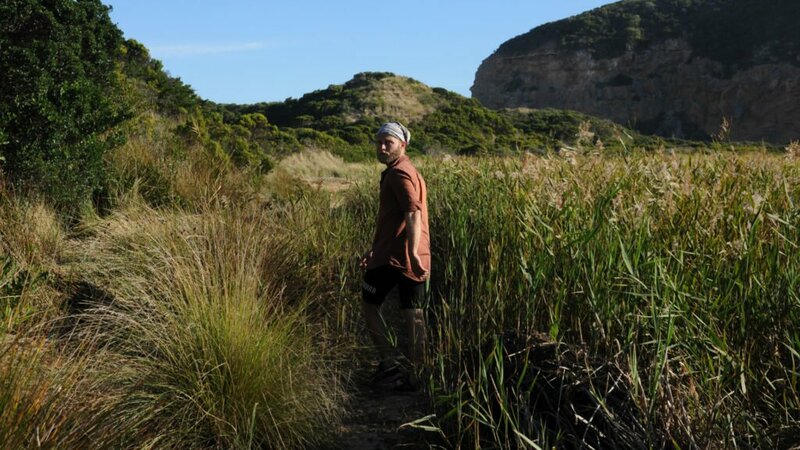 The forest required more uphills and the sea seemed to have a less “hard” path. We decided to go towards the forest and we did not regret it. In fact, it is obligatory to do it! 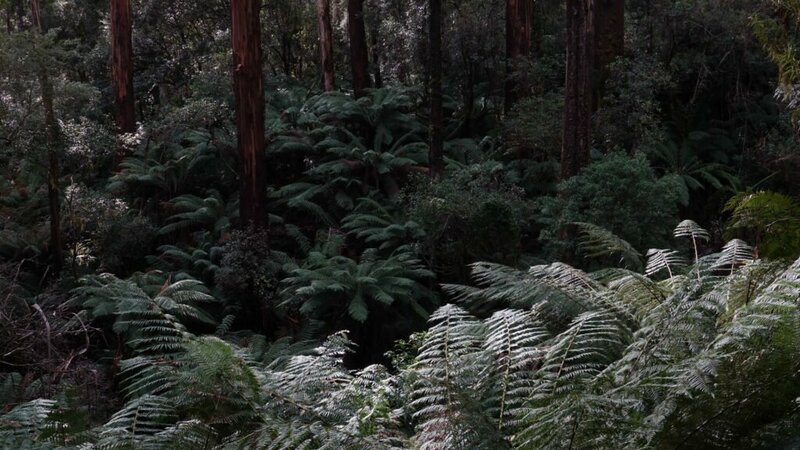 The road is pure forest, fresh air, tall trees, animal sounds. It seemed to be a movie. Many climbs but many downhills too. 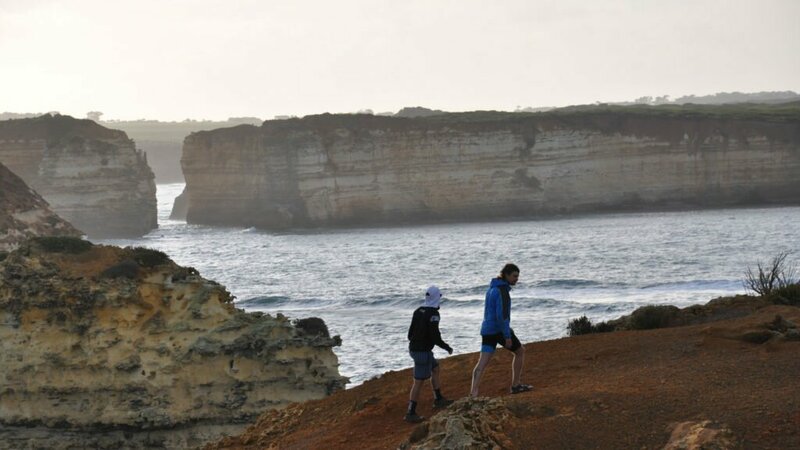 The Great Ocean Road constantly borders the sea, so climbing here is different and special. Fortunately, it was a weekday so it was not full of cars. In this section, you have to be very careful because the road is very winding and there is no place for bicycles. The cars pass very close and you always have to be visible. It’s worth it, if your idea is to do this route YOU MUST to go through this place. 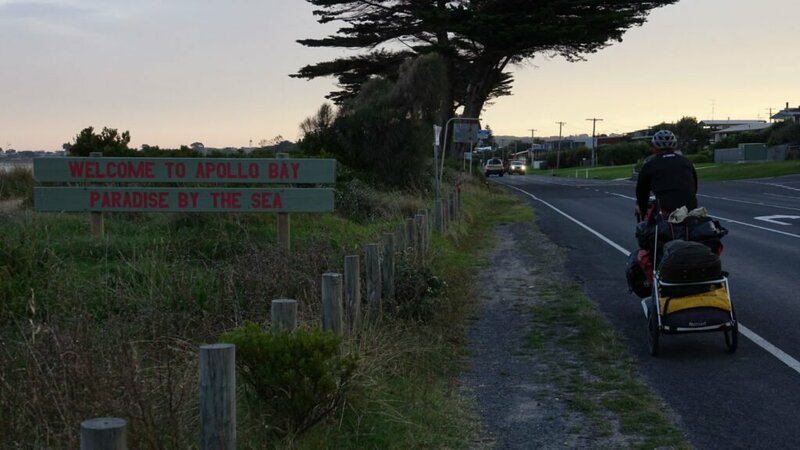 Just before arriving at Apollo Bay we called the hotel and they invited us to play that same night. Food, beers and a good bed. People got into music and we had a very fun night. We stayed one more day and we also played in the Brewhouse of the town, they gave us food and accommodation as well. 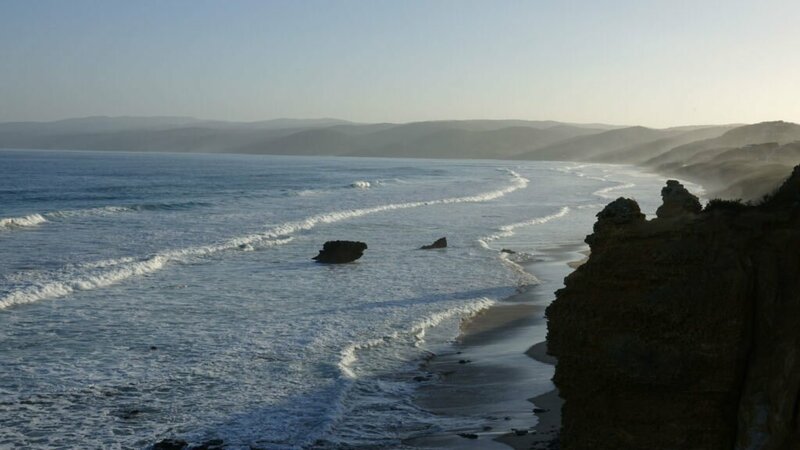 Apollo Bay has some amazing beaches and people. Another must go! This section is extremely beautiful. 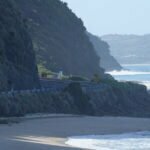 You are cycling along the coast and the whole visual is unique. 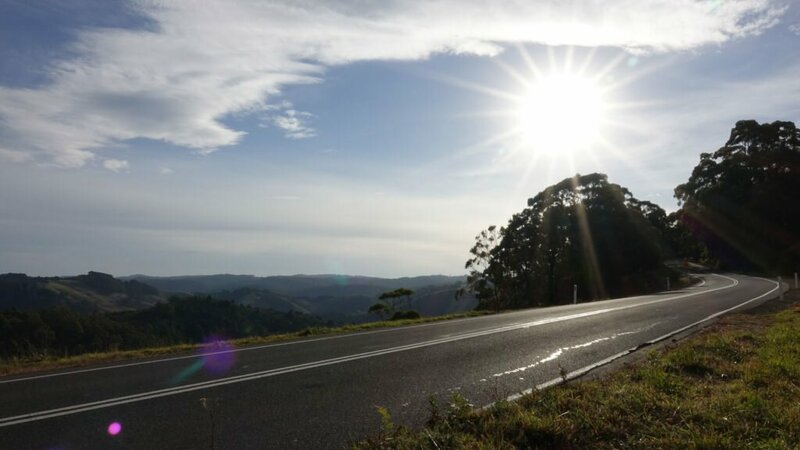 As in all the Great Ocean Road, there are long climbs, but there are also downhills to breathe a bit. We cycled all day each on their own peace and the day was great to enjoy the sport. The clear blue sky, the bays that can be seen in the distance, the joy of being in that earthly paradise. 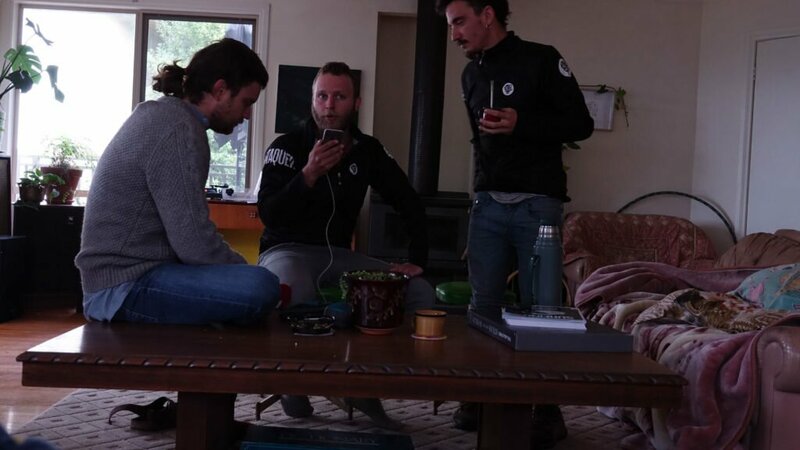 Arriving in Lorne we found a group of Argentines who lived all together in a house and invited us to come in. 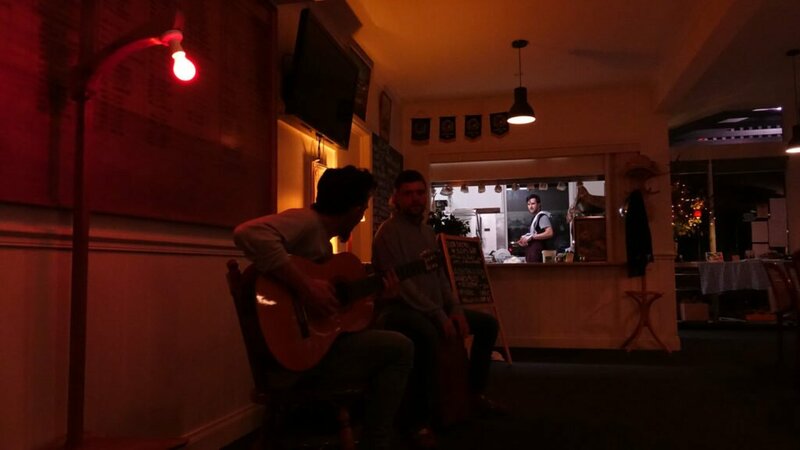 We played some music and called the Lorne bowling club. They were waiting for us with dinner ready and the sound system ready for our arrival. So we arrived and met Luke, Tobi, and Christy. They are very kind and generous people. Tobi told us that after closing the place we could sleep at his house. Luke and Christy prepared an exquisite meal for us. Again, a night to remember and with the news that the following day there would be a “jam session” at the venue. We had to go, so we decided to stay the next day too. 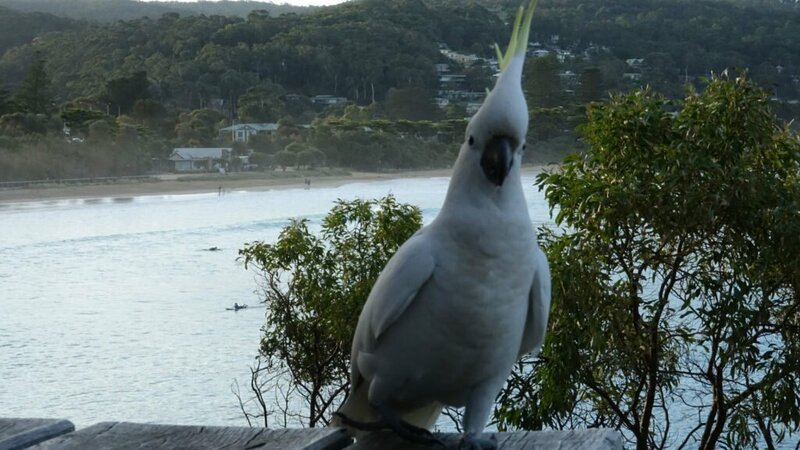 Lorne is so nice. The streets of the town have plenty of hills, a lot, and all the houses are hidden among the big trees. On the terrace of Tobi’s house, we could see and hear all kinds of birds. The house welcomed us and all the people who lived in it also. We took advantage of the fact that we had internet and we received a call from a radio station in Argentina. We answered questions and it was a productive morning. 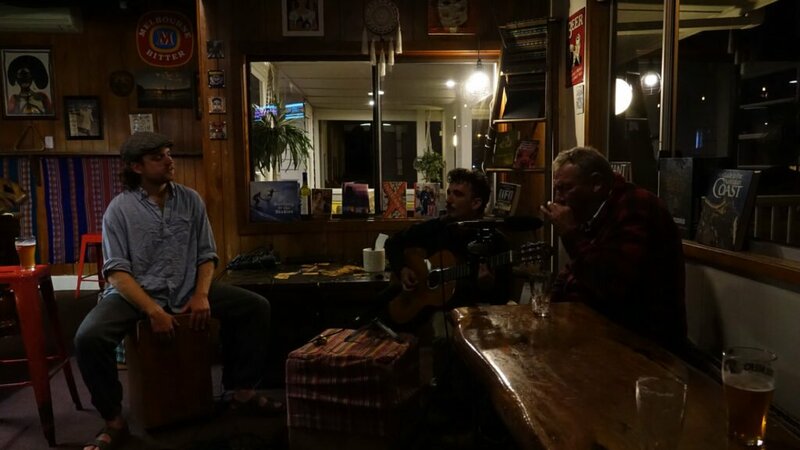 In the afternoon we walked the town and at night we went to the bowling club for the Jam Session. We played for around 4 hours between everyone. There were many people and we talked to several locals and people from nearby towns. Again, great food. We saw the lighthouse in the distance. At the end of the bay, it stood majestically waiting for us. 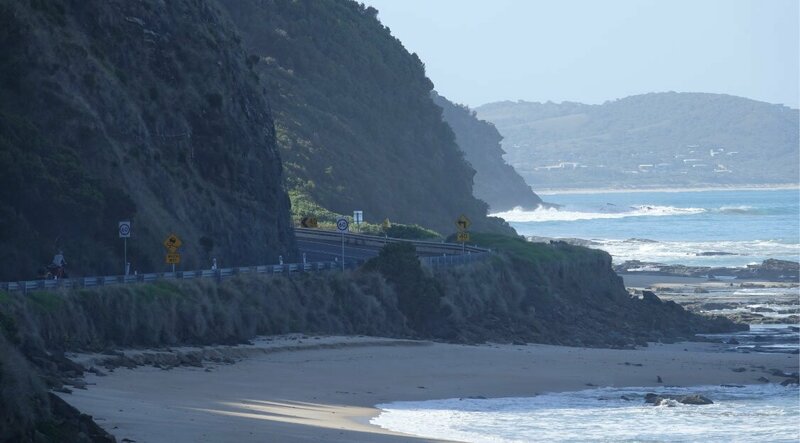 The road is similar, almost identical to the one we traveled from Apollo Bay to Lorne. Once you’re immersed you normalize the road, but every km is even more beautiful. 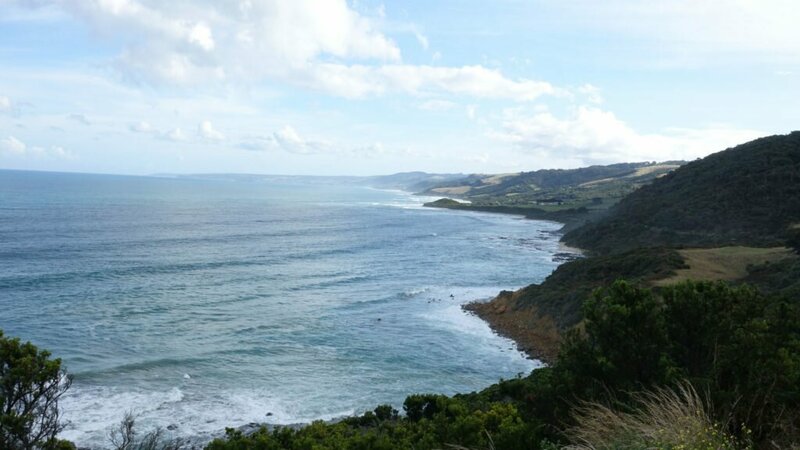 The Great Ocean Road is amazing from start to finish. Our goal was the lighthouse, we did not know the name of the town we were going to, or how many people lived there or where we were going to sleep. That did not matter, we just wanted to get to the lighthouse. 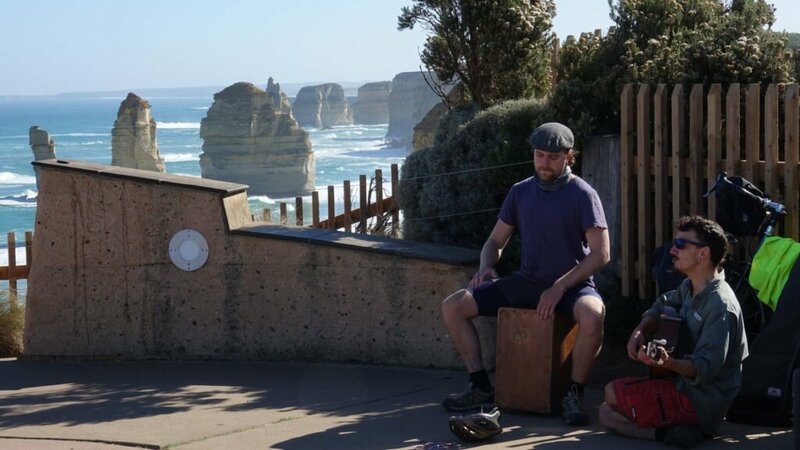 When we arrived we took out the instruments and decided to record a song in that beautiful location. We were so happy that we did not want to miss the sunset from that location, but we had to be sure we could find somewhere to sleep before the sun came down. We went to the village store, the only one to buy some vegetables. We tried to talk to some people to give us shelter but without success, we decided that we had to set up the tents. The local employee, Gill, asked us where we were going to sleep. When we answered that we had no idea, she invited us to spend the night at her house. She cooked for us an amazing risotto and we enjoyed the great company. Gill, uploaded a photo to her Instagram about us and our trip. A friend of her, Sue, commented on the post and said that she was welcoming us at her house in Geelong. 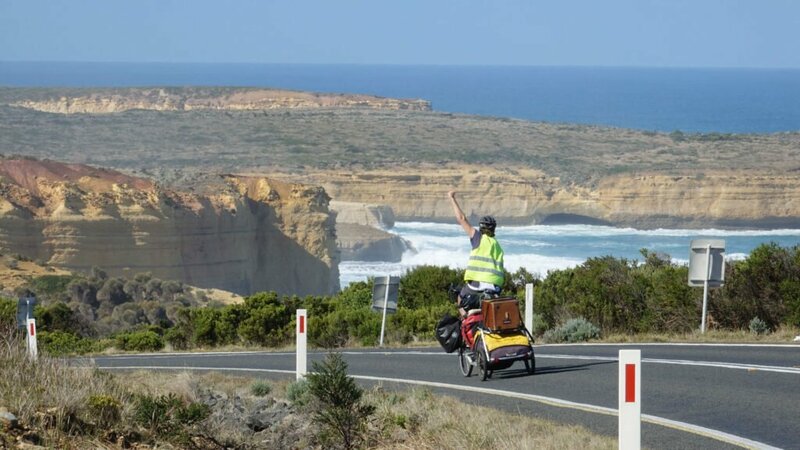 The city is passing Torquay, which is the end of the Great Ocean Road. We started pedaling with the idea that someone was going to host us so the day started with a lot of motivation. In Torquay, we only stopped to buy a fruit and rest a little. 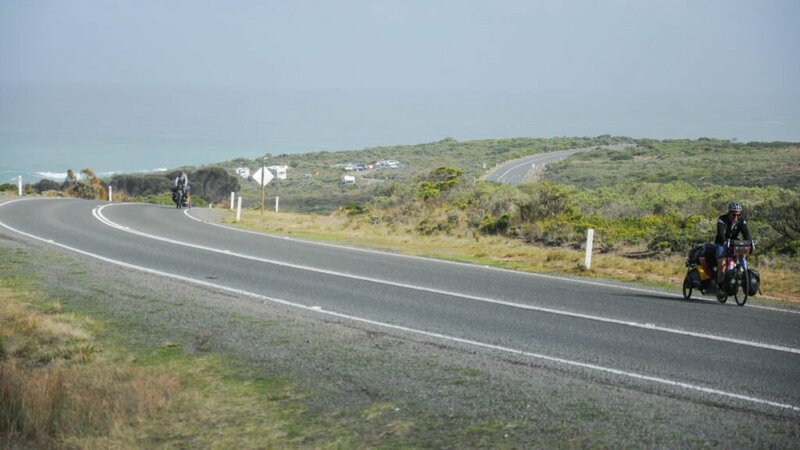 From there, only 20 km remained to reach Geelong. It was raining and the cold was increasing. 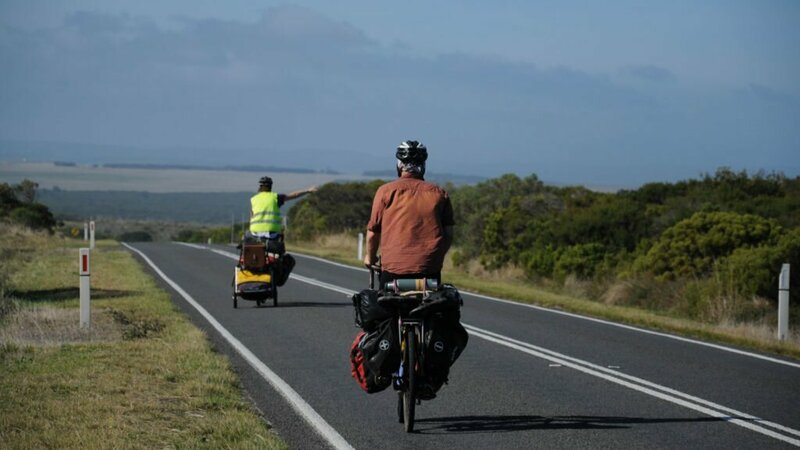 When we started cycling that last stretch we found two cycle tourists. Arith, from Sri Lanka and Johann from France. 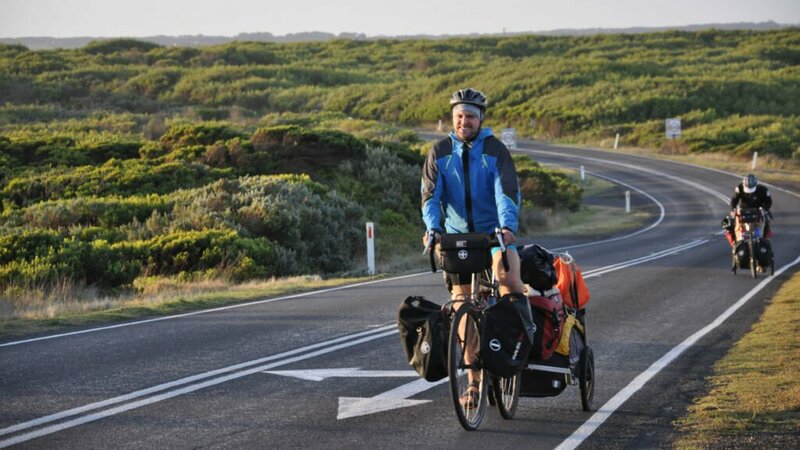 Both were pedaling long stretches through Australia and one of them was a bicycle repair technician. Although the weather was not the best, the meeting lasted about two hours under the drizzle. 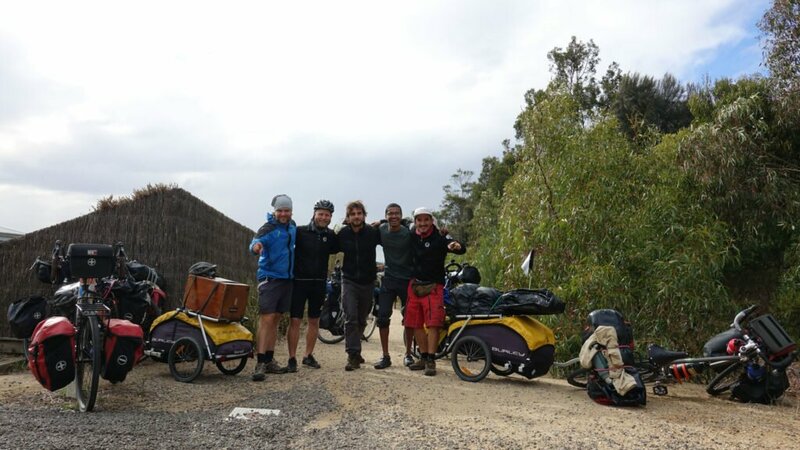 We shared many stories in common and they helped us repair some things on our bikes. 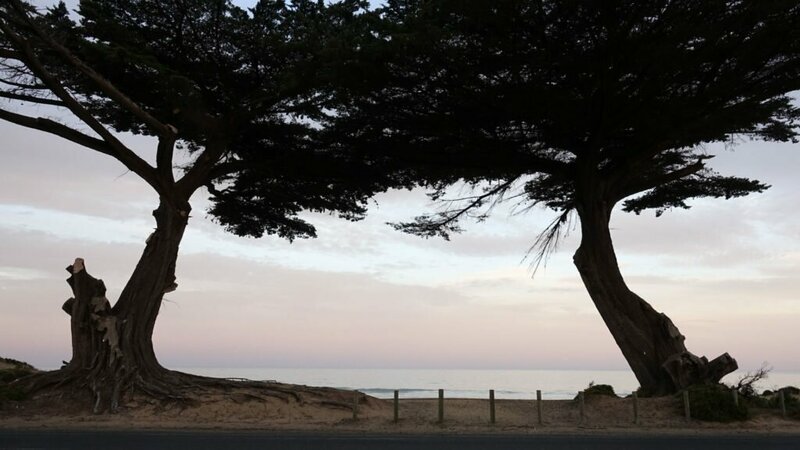 With a hug and wanting to meet again in the future, we continued our way to Geelong. 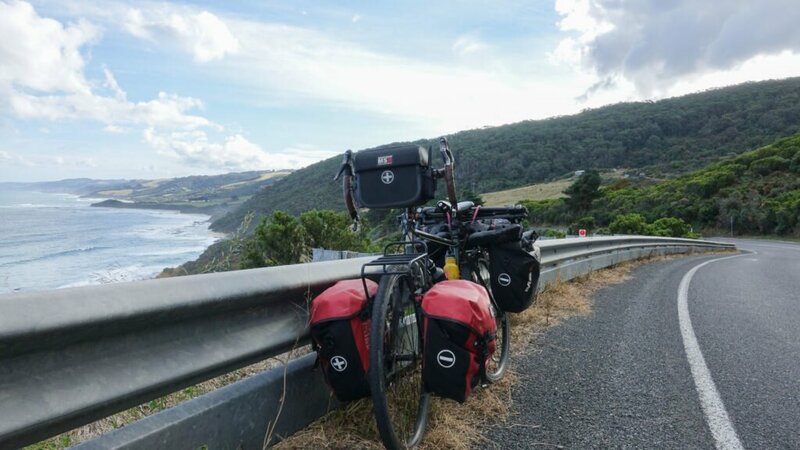 We finished the Great Ocean Road! We arrived at Geelong and the doors and life of two more people were opened to us. Sue and Justin. It would be necessary to write a book on how this couple treated us and the moments lived together with them, but it is for another story. The important thing is that we complete the route and lived one more incredible experience. If you are thinking about doing this route, stop thinking. Just go for it that you will find beautiful landscapes, people, smells, sounds, and unforgettable places. Surely this is one of the most beautiful routes through which we will travel in our life. We thank all the people who gave us their trust and support to continue making this trip a story for our future life. Let’s travel and discover places, trust and open ourselves to people, that life is only once.